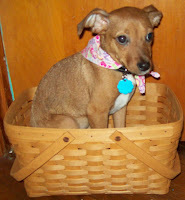 Two Bears in a Longaberger Basket: Puppy In My Basket You're As Cute As Can Be! Puppy In My Basket You're As Cute As Can Be! I have a sweet puppy (she is approx 6 months) that we adopted from a local shelter a month ago. I just adore her! Well, for good reason... looks like she shares my Longaberger passion! HAHA. 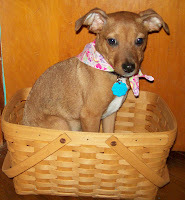 She is pictured in my Longaberger Medium Market Basket. Don't worry I have a blanket lining the bottom. Move over T oto... there's a new dog in town!